One in five children aged under five in Broken Hill have blood lead levels above the current national goal of ten micrograms per decilitre (μg/dL). And the trend is headed in the wrong direction. To pre-empt claims children are ingesting historical sources of lead, such as leaded gasoline and paint residue, we used lead isotopic analysis to show the most likely source of contamination is from the lead ore body that is still being mined. Surfaces are being recontaminated on a daily basis. 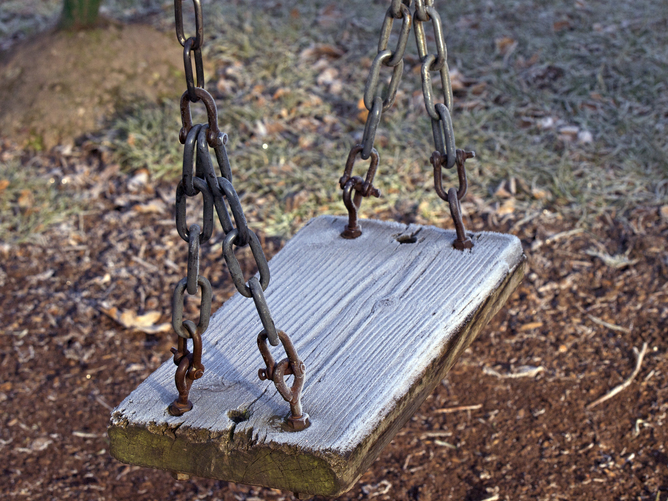 Soils in playgrounds also had elevated lead. The National Environmental Protection Measure (2013) sets a soil lead standard of 600 mg/kg for recreational spaces. Three of the six playgrounds we tested exceeded this standard and four exceeded the lower residential standard of 300 mg/kg, which may be a more appropriate standard as it also applies to daycare centres. Of the other metals we analysed (arsenic, cadmium, silver and zinc), no soil samples exceeded the relevant Australian guidelines. However, it is worth noting that Australian standards for soil metal are more liberal than our international counterparts. Although the bulk of mining today occurs underground, ore is processed at the surface and can generate large amounts of dust. It is unlikely to be a coincidence that the most impacted playground we measured was located at Zinc Lakes, less than 400 metres from an active ore processing facility. Ore processing as seen from Zinc Lakes playground. The new signage at Zinc Lakes urges children to wash their hands after play. In Broken Hill, there is currently no independent monitoring of air pollution. The monitoring that does take place is being carried out by the companies doing the polluting and is restricted, in the main, to their lease or adjacent areas and not in the larger residential environment. This monitoring does not include measurement or regulation of arsenic or cadmium, which are also known to cause significant detrimental health outcomes. Recently, questions were raised about the NSW EPA’s willingness – or ability – to fulfil this role. Mark Patrick Taylor is an elected committee member of the Lead Group (http://www.lead.org.au). The data that was collected for the research discussed in the article received support from Macquarie University′s LEAP program, which is funded by the Federal Government’s Higher Education Participation and Partnerships Program. Louise Kristensen, Marek Rouillon, and Simon Mould do not work for, consult to, own shares in or receive funding from any company or organisation that would benefit from this article. They also have no relevant affiliations.